The American Civil War was a civil war fought in the United States in the mid 19th century. The conflict was between the United States of America and the Confederate States of America. The Civil War was a pivotal moment in American history and forever changed American society, culture and politics. It was a time of emotional and physical turmoil and affected not only the people who fought in the war but also the many civilians at home all across the country. The war devastated towns, populations, caused supply shortages for both the military and civilians and brought general havoc to daily life for four long years. The Civil War took place between 1861 and 1865. Unlike other wars in history, there was no treaty that ended the Civil War and it instead came to an end with the surrender at the Appomattox Court House on April 9, 1865. 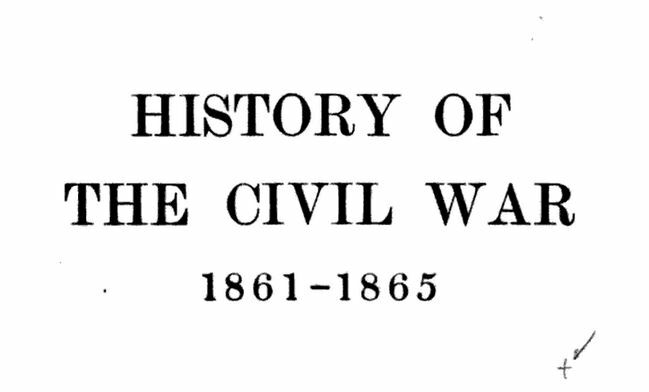 Check out this timeline of the Civil War for more information. The causes of the Civil War vary. These causes ran deep in American history and started many years before the war broke out. These issues were deeply intertwined and often went hand in hand. When Abraham Lincoln, who pledged to keep slavery out of the territories, was elected President of the United States in November of 1860, several slaves in the south seceded shortly after and formed a new nation they called the Confederate States of America. The first slave state to secede from the Union was South Carolina in December of 1860, followed within two months by Mississippi, Florida, Alabama, Georgia, Louisiana and Texas. The Lincoln administration and the government of the United States of America refused to recognize the legitimacy of secession or the authority of the Confederate States of America. The conflict came to a head in April of 1861, when the United States government refused to hand over Fort Sumter in South Carolina to the Confederate States of America. As a result, the Confederates opened fire on the fort on April 12, 1861 and captured it. On April 15, 1861, President Lincoln put out a call for 75,000 militia men to serve for three month to suppress this “insurrection.” The Confederate States of America interpreted this as a declaration of war and also put out a call to arms for Confederate troops. On May 3, Lincoln then put out another call for 42,034 United States Volunteers to serve as infantry and cavalry for three years as well as for 18,000 seamen to serve in the navy. In addition, Lincoln called for an increase of the Regular Army by adding 22,714 officers and enlisted men. What Happened During the Civil War? Between April and June of 1861, four more slave states, Virginia, Arkansas, North Carolina and Tennessee, seceded from the Union. Several battles took place this year in Virginia, West Virginia, Missouri as well as North and South Carolina. In 1861, a Union naval blockade was established along the Southern coastline and then, in March of 1862, the Union launched a campaign to seize control of the Mississippi River, which ran down the middle of the Confederate States of America, in an effort to split the Confederacy in two. Dubbed the Anaconda Plan, the idea was to put an economic stranglehold on the Confederacy to isolate it from all sources of supply and allow for growth of anti-secessionist sentiments. The war ramped up in 1862, with a number of major battles taking place, such as Shiloh in Tennessee, Second Manassass, Gaines’ Mill and Fredericksburg in Virginia and Antietam in Maryland. Knowing the South lacked the industry to sustain a long war, the Confederates began to aggressively counterattack in 1862 and again in 1863, hoping to damage morale in the North and increase pressure on Lincoln and the U.S. government with a rapid series of Confederate victories. This resulted in even bigger and bloodier battles, such as Antietam in Maryland, Gettysburg in Pennsylvania and Vicksburg in Mississippi, but the plan backfired when the Confederates suffered heavy losses, particularly at Gettysburg which was the deadliest of these battles and is considered a major turning point in the Civil War. In July of 1863, the Union had finally won complete control of the Mississippi and had successfully surrounded and divided the South, disrupting the Confederacy’s ability to obtain necessary supplies. Although the Union had the south surrounded, it was still necessary to destroy the Confederate army in order to force the South to surrender. Lincoln felt the best way to do this was by using the Union’s large army to aggressively engage the Confederates simultaneously in different locations in order to overwhelm them but found his generals were reluctant to do so. This strategy is what prompted Lincoln to promote like-minded Ulysses S. Grant to the position of Lieutenant-General in March of 1864, naming him General-in-chief of the Armies of the United States in the process. With Grant in charge, the Union Army began to fight the Confederates more aggressively. In 1864, General William Tecumseh Sherman led his troops on his famous March to the Sea, capturing and destroying anything they came across, which further deprived the Confederates of the food and supplies they so desperately needed. While Sherman was on his March to the Sea, Grant marched his troops towards General Robert E. Lee and his army in Northern Virginia. After Grant captured the capital of the Confederacy, Richmond, Va in April of 1865, the Confederate’s line of commands were completely disrupted. The Civil War finally came to an end after Lee and his Army of Northern Virginia became trapped by invading Union forces in Appomattox county, Va and were forced to surrender. This prompted similar surrenders by remaining Confederate troops across the South, which finally brought the Civil War to a close. To learn more about the Civil War, check out the following article on the Best Books About the Civil War.